Princeton University Press, 9780691013527, 200pp. 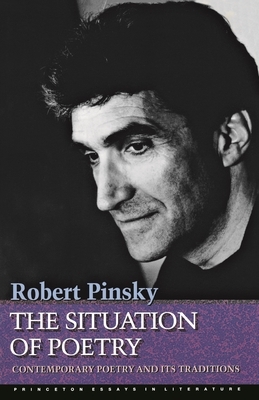 In this book Robert Pinsky writes about contemporary poetry as it reflects its modernist and Romantic past. He isolates certain persistent ideas about poetry's situation relative to life and focuses on the conflict the poet faces between the nature of words and poetic forms on one side, and the nature of experience on the other. The author ranges for his often surprising examples from Keats to the great modernists such as Stevens and Williams, to the contents of recent magazines. He considers work by Ammons, Ashbery, Bogan, Ginsberg, Lowell, Merwin, O'Hara, and younger writers, offering judgments and enthusiasms from a viewpoint that is consistent but unstereotyped. Like his poetry, Robert Pinsky's criticism joins the traditional and the innovative in ways that are thoughtful and unmistakably his own. His book is a bold essay on the contemporary situation in poetry, on the dazzling achievements of modernism, and on the nature or "situation" of poetry itself.